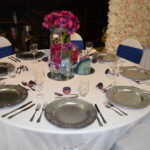 The effect, on the overall look of your venue, of well thought-out table linen is considerable. For drama go for bold colours. But if understated elegance is the look you’re aiming for then select subtle hues. The choices are numerous, go for the classic look with white cotton table cloths. Add sparkle with sequinned table cloths in a variety of colours. Opt for passion and drama with crushed velvet. Whatever your theme, you can find table linen to complement your chosen decor. Dramatic, sumptuous, luxurious- just some of the ways to describe our range of velvet table linen. Choose from a range of colours to bring your venue decor to life. 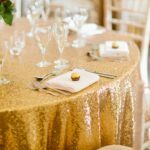 Sophisticated and elegant, our range of sequinned table linen will dress your venue beautifully. Choose from gold, rose gold, silver, champagne or black. 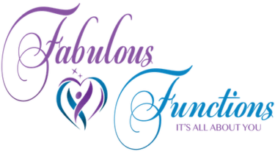 Each colour will enhance your venue decor and coordinate with your chosen theme. The images below indicate what can be achieved with different table linens. 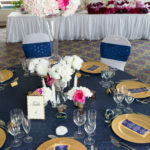 Royal Blue crushed velvet table linen can help to create a themed decor for your venue. 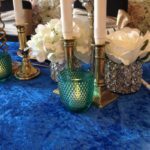 Crushed velvet adds a touch of luxury to your table decor. Available in a range of colours, you can go for the dramatic effect or be more subtile with the pastel colours. Whatever your choice , your tables will look sumptuous. This is such a perfect combination. 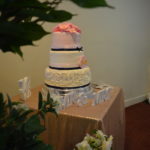 the cake table is all decked out with a rose gold table linen and eh wedding cake ready for the bride and groom. 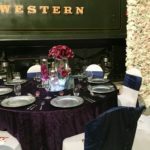 To give your venue that WOW factor combine your choice of linen with a spectacular centrepiece to achieve a harmonious look to your venue decor.